Find hotel near The Bollywood Club- By Ti .. If you are looking for a place to party in Goa, The Bollywood Club- By Titos in Baga is just the right place for you. One of the famous nightclubs in the city, this place is always crowded with locals and tourists alike. The entry to this place is to be booked online and in advance, due to its popularity and demand. An ideal club to visit with families, friends and loved ones, the club gets very lively on weekends and you can also experience live music/band performances occasionally. The club offers a great menu for food and drinks at affordable prices. The club also offers an open bar for ladies’ night on discounted rates. Tito's is the oldest and fancy club in Goa. It is located near Baga beach. Crowd is great even stag is allowed they also newly opened Tito's lounge that is also great. Stag entry is expensive, couple entry is reasonable. Club is open till 3am. After paying cover drinks are unlimited. But they have domestic drinks. Overall worth going. 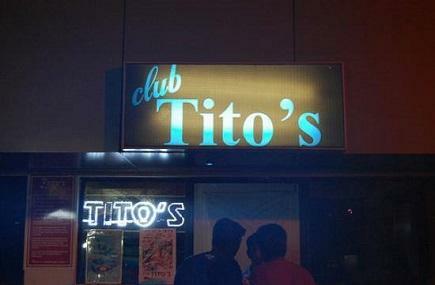 TITO'S GOA A nightclub, music club or club, is an entertainment venue and bar that usually operates late into the night. A nightclub is generally distinguished from regular bars, pubs or taverns by the inclusion of a stage for live music, one or more dance floor areas and a DJ booth, where a DJ plays recorded music.Inside the nightclub, bouncers are responsible for ensuring staff and client safety. They keep an eye out for patrons who have overindulged, remove rowdy customers harassing the help and break up any fights or arguments that may occur. Loved it. Great place. Loved the food. Great variety. Would recommend to all. Location is good too. Must try this place. For vegetarians this place is must to visit. Even the price was awesome and apt as compared to the quality and quantity of food served. Tito's club Goa Must visit place if you are in goa. The tickets price varies depending upon the category you chose and also differs on weekend and weekday. They provide unlimited drinks and food, food is not worth and not much options apart from french fries and sandwiches. Good music and a good dance floor, operates till late night. No re entry is allowed at this club.